I am currently reading two non-fiction books. One called Sapiens about the development and success of Homo Sapiens and another called I Contain Multitudes about the relationship between people and microorganisms. I am also thinking about a poem I am going to write about Vietnamese soup. So how do these three seemingly disparate texts relate to one and another? Surprisingly well if one squints a little. There are a couple points that I hope to mesh together when I finally write this poem (This little bit of prose here is to get some of the ideas straightened around in my head as to what I am going to end up with.) I’ve made a couple starts on the piece – the whole idea started as a challenge from a 5th grader in Tanzania. I’ve had two false starts so far. Not really false starts though – just paths that I am not going to go down – writing a poem can be like playing Let’s Make a Deal – choosing what is behind door number one two three – etc. except there are innumerable doors and they keep appearing throughout the process. So, what I’ve managed to do is close off two doors – and complete whole bunch of pointless surfing of the web. The two things I have gleaned from my reading so far: I Contain Multitudes – that once you’ve entered the realm of the microorganism the laws of probability are thrown out the window because of the sheer insanity of the numbers you are now working with. A million in one shot is going to happen thousands of time amongst a colony of bacteria for instance – of course I just pulled that number out of the air – but the gist is true and that gist is enough to have derailed the piece I was working on about Vietnamese soup – because that concept was too good not to use somewhere – so I got that going on now. But what if they did? What kind of craziness is going on at that microbial level – power structures, religious fanaticism leading to bacterial infections – viral marketing on the actual viral level? All based on fictions – or in other words lies agreed to be believed. So, this brings us to Pho – that delicious Vietnamese staple – my favorite food on the planet – my go-to comfort bowl of noodly warmth in any stormy port upon this globe. How does this fit in with microorganisms and shared fiction? I’m not sure but I think it has to do with the fact that the traditional method of cooking the stuff is in a giant cauldron of a iron pot and rather than ever emptying the vessel – the bone broth is simply added to – it is a veritable sourdough approach – it is quite possible that an atom – or a microorganism has remained in that pot from the very beginning – from the first day it was started – a microscopic witness to all time as far as that consommé universe was concerned. So these are the things I’m rolling around – and this little bit of writing you’re reading right now is just a way for me to think about it. Now I’ve stretched some of these ideas I’m sure – and I’m most likely less than half right on what I’ve posited. I’m not even sure about the idea of the soup never being totally emptied from the pot – I’m petty sure I heard of it – but it fits my narrative so I’m going with it – please don’t correct me on any of this. It’s a fiction I need in order to move ahead. 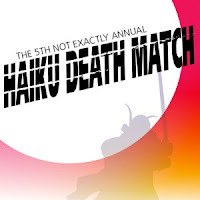 The 5th Not-Exactly-Annual Haiku Death Match is only 5 days away! To celebrate the countdown to the haiku contest, for the las two weeks I have featured a haiku (or senryu) from each of the deathmatch contestents. And don't forget that for just a few dollars you can sponsor a haiku warrior team! Sponsor a haiku warrior team! Once again, it's National Poetry month, so if you want poems to read and prompts to write poetry, this is the month! There's a wide smörgåsbord available. --and April is a great month to attend live poetry events. 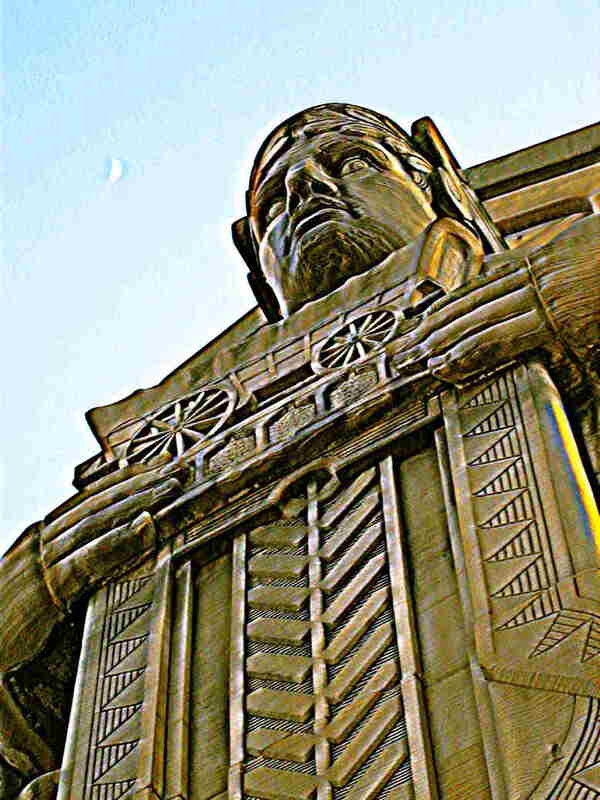 Check out what's happening at any of the 65 readings, poetry workshops, and other writing-related events going on in April, listed on the Clevelandpoetics Calendar. And don't miss this Saturday's Heights Arts Haiku Deathmatch at Dobama (OK, I guess I've mentioned this before). Heights Arts says: Happy National Poetry Month! BROADCAST WEEKEND 04/01/17April is Poetry Month, and we observe it with participants in Cleveland’s Haiku Death Match reading their poems, and we hear verse from Ken Nordine, Alastair Reid, Shel Silverstein and Bob and Ray. ...and then on WCLV again Wednesday, April 5 at 2:30pm when poets Christine Howey and Ray McNiece will be interviewed on the air. Don't have a radio? Listen live online or by MP3. Have you ordered your tickets for the Haiku Death Match? We're looking forward to a rollicking night of poetry, entertainment, and audience interaction.